The first underground diggers were primarily diesel powered skid steer loaders (bobcats). In 1980 the first purpose built hydraulic digger was made by Knud Nexo as an add on to a blower (essentially a giant vacuum cleaner). 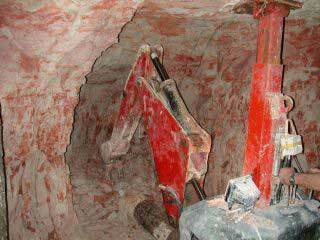 Hydraulic diggers work on the same principal as a ordinary backhoe, expect that the hydraulic excavating arm is pinned to the roof and floor of an opal mine by a large hydraulic ram. The excavating arm usually has tungsten carbide tipped teeth mounted in parallel or on a rotating drum. 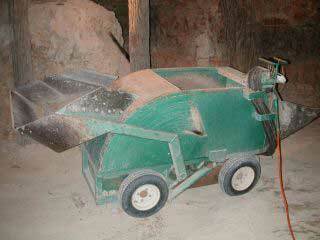 Power is most commonly provided by a hydraulic power pack located on the surface of the mine. Since 1990 electric and compressed air powered boggers have also come into use on the opal fields. Typically they have a shovel that lifts previously excavated claystone into a 200 litre (44 gallon) bin, and then the miner drives the bogger back to the haulage mine shaft where the claystone is dumped into the bucket of an automatic hoist. The hoist is then activated and the claystone is transported up the haulage shaft to be automatically dumped by the hoist into the back of a tip truck located on the surface. 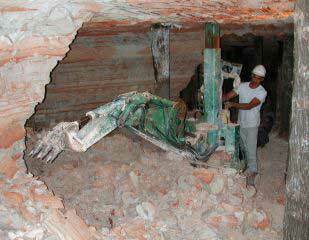 Hydraulic digger, Coocoran opal fields, Lightning Ridge, 2001. 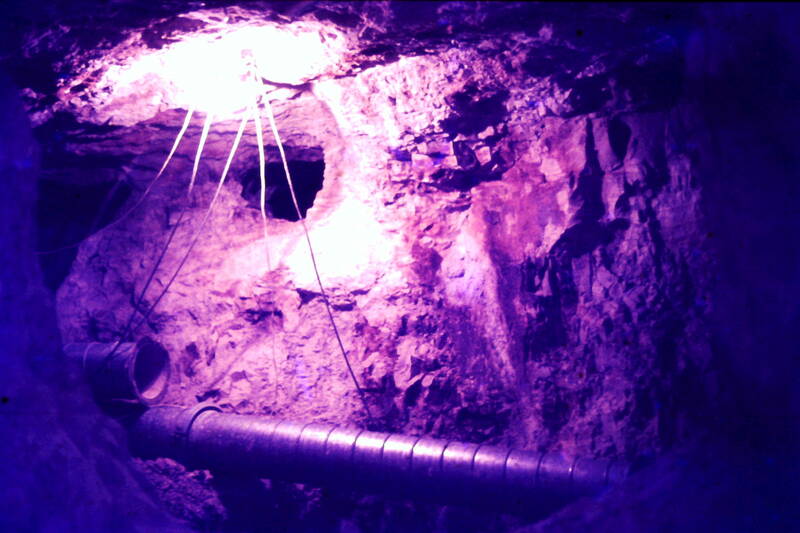 Electric bogger, Grawin opal fields, Lightning Ridge, 2001.